Andrew Shelley set himself the challenge of running the Brighton Marathon at the start of the year and on Sunday 14th April, he completed this gruelling challenge. 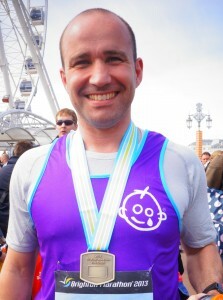 Completing the marathon in an impressive 3.45 hours, Andrew has raised over £700 for Great Ormond Street Hospital. Everyone here at Simply Washrooms is incredibly proud of Andrews amazing achievement – well done!